Out of the many car brands we know, Nissan is among the best known and reliable automobiles we have in the market. Nissan and a battery producing firm, Eaton are working on a new home energy battery made from other recycled batteries sourced from Nissan’s electric cars offerings. This is according to Nissan’s Europe chairman, Paul Wilcox, who recently confirmed the reports in an event in East London. 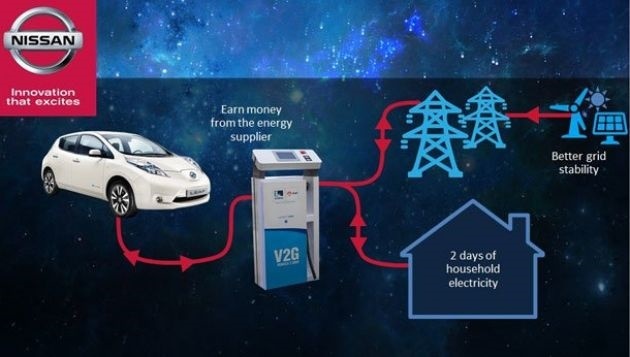 The energy storage product is currently undergoing trials in the UK, allowing owners with electric vehicles sell the excess energy stored in this devices back to the national grid. Dubbed V2G Project or vehicle-to-grid technology is said to be installed close to one hundred homes. However, the homes in which the energy storage devices are being installed are those of Nissan LEAF and e-NV 200 electric car owners. This enables them plug in the car chargers and recharge their drained batteries. The excess or unused energy is sold back to the national grid. This move is meant to rival Tesla’s Powerwall project and Mercedes Daimler who are in the forefront in offering home energy storage systems in European homes. xStorage, the energy storage device uses 12 LEAF battery modules. This batteries can save up enough renewable power from residential power supply or other energy sources such as solar, cheaply, allowing homeowners access the stored power at any time. The system is a ready to use energy storage device that offers 4.2 KWh on the nominal. In order to use it, the installer will have to install the necessary additional cables in order to connect it to the national grid or solar panels. UK has over 18,000 Nissan Leafs on its roads and if xStorage was installed for each vehicle, this means that UK could generate virtual power of up to 370 GW through this vehicle to grid system. In Europe, Eaton boast of over 77 certified installers and 1000 distributers. The energy storage system targets customers who use solar energy as their main source of power. This is because, the system provides additional battery pack hence a good backup solution that ensures a home is not out of power at any time. In addition, it eliminates the need to constantly use the grid whose energy cost and demand soars high in the peak season. xStorage is also meant for electric car owners as it is a fully integrated energy storage solution that provides the much needed safety in the use of renewable energy in the long run. In addition, the battery pack offers a good performance to owners as it helps in charging the electric vehicles using clean power. It is easy to plug and power immediately after installation by a certified installer. xStorage will also have smartphone app or connectivity, allowing owners to flick between energy sources using a button. xStorage is set to provide homeowners with the ability to control how much power they need in their homes. According to Paul Wilcox, the battery combines Nissan leaf’s expertise in designing vehicles and that of Eaton’s’ experience in producing efficient batteries. This combination results to the coming up of xStorage energy device, a formidable second life battery solution. It has been designed for easy usability despite it being an energy storage device with high specifications. Nissan has put its expertise to use in designing this quality and affordable battery, giving consumers a smarter and more sustainable energy management capabilities. xStorage offers flexibility and multiple cost saving advantages to electric vehicle owners. The energy storage device will offer a second life to the electric car’s battery that is most likely drained or has exhausted its first life. A battery pack powered by 12 Nissan EV battery modules is going to revolutionise how people handle renewable energy in their homes. The starting price of xStorage with a capacity of 4.2KWh will be approximately $4600, which is higher compared to Tesla’s Powerwall going for about $3500. There are no hidden extra cost that come with the xStorage system. Over the next five years, Eaton and Nissan expect to sell over 100,000 units as the demand for stationary storage grows. However, with the rising government and public enthusiasm for cleaner energy in most countries, both Nissan and Eaton could experience more demand for this product in the future. Find out how to buy the Nissan xStorage here.